Within three years of opening, Restoration MedSpa has become one of the most trusted medical spas in the U.S. In fact, founder Marisa Faircloth, PA-C, is a Master Injector with Allergan and her practice is ranked in the top one percent nationally. During this meteoric rise to the top, Restoration MedSpa has never cut corners with their state-of-the-art quality treatments and services. With two locations in Winston-Salem and Greensboro, more people are putting their best face forward with personalized services through Restoration MedSpa. Marisa accredits the success of her practice to taking a customized approach to the ever-changing field of non-invasive cosmetic procedures and enhancing each patient’s attributes in a safe and natural way. Marisa believes that a little self-improvement can go a long way. She and her expertly trained staff ensure that each person finds the right treatment options in an environment where they feel pampered and cared about. CoolSculpting is non-invasive and causes the fat to break down and be naturally eliminated over a three-to-four month period. It may sound too good to be true, but the results speak for themselves. Restoration MedSpa is the only Master Level CoolSculpting practice in the area, and every employee is CoolSculpting Certified to ensure patients experience optimum results. Slimming down is just breaking the surface of what is available at Restoration MedSpa. Marisa is able to fill lines and wrinkles in less than 30 minutes. The products she chooses to use typically last from one to three years. She can also use fillers to volumize and lift cheeks, jawlines, and temples and fill out thin lips or even plump sagging hands. Restoration MedSpa is a leading provider of Ultherapy® for tissue tightening. This revolutionary treatment uses ultrasound to transform the chest, neck, chin and brow. Ultherapy bypasses the surface of the skin to deliver ultrasound energy at the appropriate depth and temperature. This energy triggers a natural response under the skin, jumpstarting the regenerative process that produces fresh, new tissue tightening collagen. Restoration MedSpa also offers state-of-the-art HydraFacial treatments, which are great for deep cleansing, exfoliation, and skin brightening. In addition, a variety of laser services for skin rejuvenation and BioTE® bioidentical hormone replacement therapy are available. 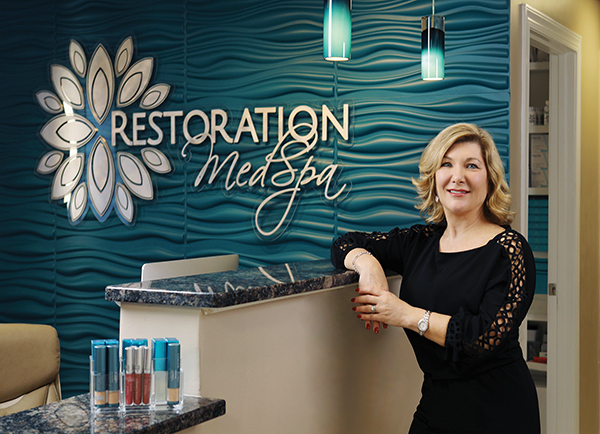 In an ever-changing industry with new products and procedures constantly surfacing, Restoration MedSpa stands above the rest with cutting-edge treatment options and products to provide the very best for its clients. Restoration MedSpa in Winston-Salem is located at 250 Executive Park Blvd, Suite 105 and in Greensboro at 1002 N. Church Street, Suite 101. For more information visit RestorationMedSpa.com or call 336.999.8295.